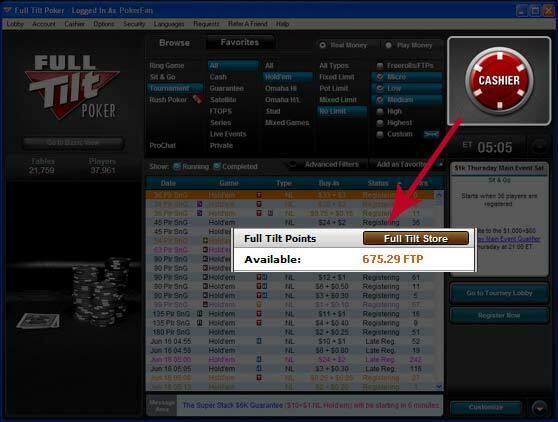 The Full Tilt Poker points and reward system can appear quite complex at first glance, however once you understand the different elements you can make sure that you are getting the highest rewards in return for your loyalty and time playing at the tables. It’s not that difficult to understand and in this guide I am going to simplify it and break it down into easy to understand chunks. The rewards scheme is based on Full Tilt Poker Points, also known as FTPs, which are gained every time you play at any real money table, be it a cash game, tournament, or sit and go. They are only rewarded at real money tables, so the play money tables are not included. It is the room’s way of rewarding regular players, so basically the more you play the more points will be awarded to you. These points are the currency of the loyalty scheme and form the basis for the player rewards scheme called “Edge”. They can also be used to buy-in to special FTP cash tournaments and satellites or exchange for cash bonuses at the “Diamond Edge” store. 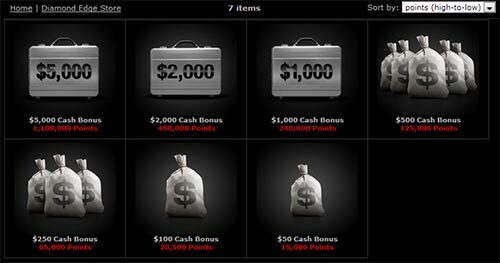 Finally, they are also used to clear bonuses which you can read more about in our Full Tilt Poker Bonus Guide. The way points are awarded depends on whether you are playing at a cash table, or in a tournament. Lets take a look at each in turn. You earn FTPs on any hand in which you have contributed to the pot. In each hand a number of FTPs is awarded based on the total “rake” taken in each hand. The rake is the fee that is deducted from the pot by the poker room and at Full Tilt is approximately 5% of the total pot (although this is capped usually at $3). For each $1 in rake then 10 Full Tilt Points are awarded and are divided up between all players who have contributed to the hand proportionally. A hand is dealt at a table with 5 players sat down. By the end of the hand the total pot is $50 of which a “rake” fee of $2.50 has been collected by the poker room. Players 1 and 2 both folded their hands without contributing to the pot – so they are not awarded any FTPs for this hand. Note that if the rake cap is reached then it gets a little more complicated than the above example, as only the rake contributed before the cap is reached is taken into account when your share is calculated, but it’s not really worth worrying about too much. Also for rake amounts that aren’t exact dollars partial points are awarded. For example, if $0.75 in rake was taken from a hand then 7.5 FTP’s would be awarded. It is much simpler to calculate how many points you are awarded for playing in a multi-table Tournament or Sit and Go Tournament. When you enter a tournament the fee (or rake) that you pay is displayed. For example the entry fee may be displayed as $10 + $1. This means that the total entry fee is $11 of which $10 goes into the prize pool and $1 is the fee collected by Full Tilt. Again for every $1 in fees paid then you are awarded 10 Full Tilt Poker points, so in the above example you would be awarded 10 FTPs. If you entered a $200 + $15 tournament then you would get 150 points ($15 x 10 points). All points are awarded at the end of every raked hand (cash table) or when the tournament / sit and go have finished. How do you earn the most Points? The trick is to not focus on trying to earn points but to play in the games that you enjoy. If you enjoy playing in sit and go tournaments then play those. You will find that by playing the games you enjoy will lead to you playing more and in turn earning more points. Full Tilt do run a number of promotions that help to boost your player point balance. Happy Hour – Playing at a table that has been assigned as a happy hour table will boost your points balance by earning double or even triple points for the same amount of effort. To find the tables that are offering this happy hour bonus just look for the lemon slice icon (think cocktails!) next to the table in the lobby. Early Bird – If you are one of the first players to register for a sit & go tournament then you will earn double points. Be one of the first two players registered in a 6 man Sit & Go, or the first three players in an 8 or 9 man Sit & Go, or in the first 6 players registered in an 18 man Sit & Go. Game of the Week – Play in the assigned game of the week and you will earn double Full Tilt Points. Every week, a different game type (such as Pot Limit Omaha) is designated as the “Game of the Week” and will be advertised in the software and also on the website. Look for the lemon slice in the lobby for tables that are in “happy hour” to earn double or triple points. What can you do with FTPs? Your FTP balance will be used as a the basis for the Edge Rewards Program, which we’ll look at next. But you can also use your points to exchange for free Tournament entry tickets or Ring Game tickets by visiting the Full Tilt Store. There are also special poker tournaments or sit and go’s that you can only enter by using Full Tilt Points. A lot of the time these tournaments are satellites to big money live events or online tournaments. Earning points is also the way that you clear any deposit bonus that you have been awarded. For more details see our Full Tilt Poker Bonus Guide. You can check how many points you have accumulated by clicking the red Cashier button in the game lobby where your FTP balance will be displayed. What is the Edge Rewards Program? 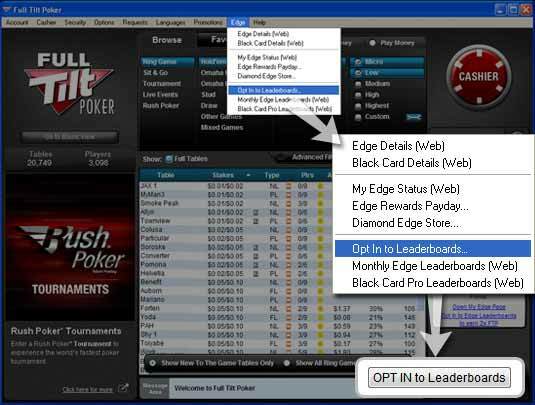 The Edge Rewards Program is a way of earning a status at Full Tilt Poker which gives you access to even more rewards. It is based on the number of FTPs that you earn and the more you earn then the higher the status level and rewards you receive. There are 7 status levels that you can achieve in ascending order as follows: Bronze, Silver, Gold, Platinum, Diamond and Black Card. How is my Edge status calculated? Your status is calculated based on an rolling average of the FTPs that you earn on a daily basis. There are three ways to earn a status, a 7-day, a 30-day or a 100-day rolling average. This is a good method as it means that you don’t need to play every day to earn or keep your status. Silver – 50 FTPs/day (7-day avg), 35 FTPs/day (30-day avg), 25 FTPs/day (100-day avg). Gold – 100 FTPs/day (7-day avg), 75 FTPs/day (30-day avg), 50 FTPs/day (100-day avg). Platinum – 150 FTPs/day (30-day avg), 100 FTPs/day (100-day avg). Diamond – 350 FTPs/day (30-day avg), 250 FTPs/day (100-day avg). Lets say that you play just a little bit over the course of a week and earn 84 FTPs. 84 divided by 7 days is an average of 12 FTPs per day which is enough to earn you Bronze Level Edge status. Now over the course of 1 month you play a bit more and have accumulated 2,400 FTPs which is an 30-day rolling average of 80 FTPs. You have now earned Gold Level Edge Status. As you can see the requirements are much less on the longer 30 and 100 day rolling averages, so the longer and more consistently you play, the easier it is to earn / maintain a higher status level. What do I get for earning an Edge Status Level? Find out how you stack up against your fellow players on the same level as you. There are a number of different leaderboards based on the type of game you play and the stake levels. The top 3 players of each monthly leaderboard are awarded a cash prize of 1st $500, 2nd $300 and 3rd $200. The top 25 finishers are awarded a status upgrade to the next Edge level. To participate you must opt in by logging in and selecting “Opt in to Leaderboards” in the “Edge” drop down menu at the top of the screen. Once you have an Edge status level you are eligible to enter the exclusive Edge Daily Freerolls. There are two each day with a prize pool of $500 worth of Tournament (entry) Dollars or Ring Game Tickets. The freerolls cost 25 FTPs to enter. Bronze Level players also have access to two Freeroll tournament each Sunday with a prize of $1,000 worth of Tournament / Ring Game tickets. Achieve Silver Level Edge status or higher and you will be awarded cash payments directly into your player balance. This is a form of cashback to reward loyal and regular players. Edge Rewards cash back is paid directly into your player account once per week. Players who achieve Diamond or Black level status will be able to use the Diamond Edge Store to exchange their Full Tilt Points for additional cash back. 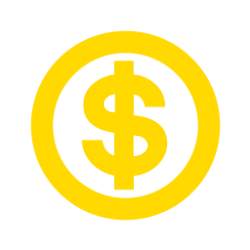 This is on top of the regular weekly cash back and there are a number of cash bonus packages that can be bought using your FTPs. Earn Black Card status and you will receive the highest level of rewards available and be treated like a real VIP. You will receive a physical Black Card after you have maintained this status for more than 100 days which will not only act as a status symbol to show off to your poker buddies, but will also be used as your ID to enter the special Black Card live events where you will be treated like a King. On top of all the rewards listed above, you will also be able to convert your FTPs into cash at a higher rate of $1 for every 200 points (on top of normal weekly cash back). Finally you will have the chance to compete in the Black Card Leaderboard to earn a Black Card Pro sponsorship which awards a prestigious and lucrative Pro sponsorship deal to the players that are ranked the highest on each leaderboard. Time to get playing and earning Points! Now that you understand the full range of rewards offered by Full Tilt Poker, there is no longer any excuse. 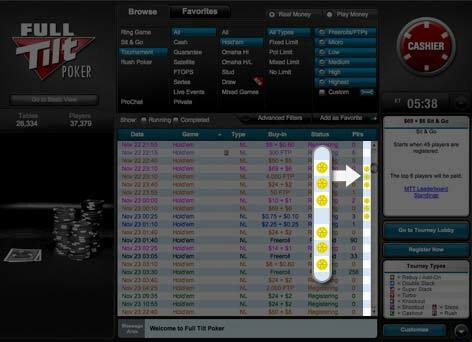 Full Tilt points are a very important part of every players Full Tilt Poker experience. You can really boost your poker winnings by taking advantage of player points rewards. 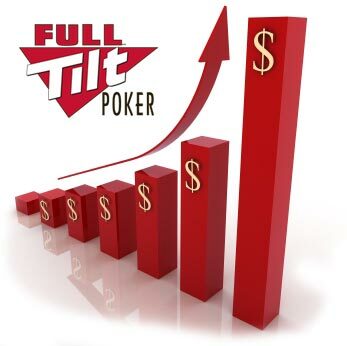 Download Full Tilt Poker now to get started. Thanks - I really appreciate your support! 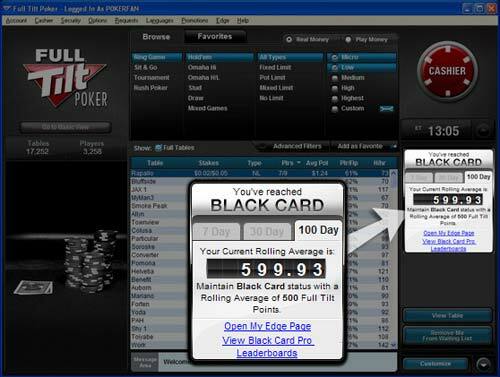 DownloadPoker.org is a leading poker information website. Visitors will find the latest & funniest poker gossip, a comprehensive player database, guides to the leading poker rooms, answers to popular poker questions and so much more.